Twice the coverage with half the effort! Kwazar Mercury Pro + Spray Bottles might be the best sprayers you ever use! These trigger sprayers deliver twice the output per pump, trimming time and effort off every detail you do. Kwazar Mercury Pro + Spray Bottles are professional grade, adjustable, double-action sprayers suitable for any detailing job. Kwazar Mercury Pro + Spray Bottles are designed specifically for cleaning and detailing professionals. Fill each sprayer with window cleaner, wheel cleaner, all purpose cleaner, clay lubricant, or carpet cleaner. Kwazar Mercury Pro + Spray Bottles are great for diluted concentrates, but you may even transfer products from their manufacturer spray bottles to the Kwazar spray bottles because they just work better! 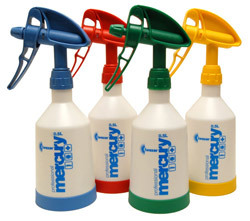 Every pump of a Kwazar Mercury Pro + Spray Bottle delivers twice the product onto the surface! Coat vehicle surfaces in seconds. Spray down the tires and wheel wells quickly or cover large windshields with glass cleaner in no time. When you're working in a high volume detail shop, every second counts! Kwazar Mercury Pro + Spray Bottles are made from durable materials with Viton seals that provide excellent resistance to aggressive chemicals. Each Kwazar sprayer includes an integrated fluid filter and a translucent bottle with embossed scale for easy measuring. The adjustable Kwazar sprayer allows for pinpoint spraying to fine misting and everything in between. Use it to spray a fine mist of quick detailer over the paint or zero in on bugs and tar with an intensive cleaner. 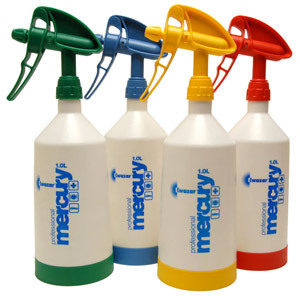 There are countless uses for Kwazar Mercury Pro + Spray Bottles in the garage and the home. Coat surfaces more quickly with professional grade, double-action Kwazar Mercury Pro + .5 Liter and 1 Liter Spray Bottles! Available in 0.5 Liter (17 oz.) and 1 Liter (33oz. ).